Names such as the Astrolabe reef, Beqa lagoon or Bligh Channel are world famous, and rightly so. Is there a better place to dive, than amongst the 300+ islands of Fiji? We don't think so. While there are some fantastic dive sites around the world, few places pack so many great sites into one area (albeit a very large area). Soft Coral capital Of The World? This phrase is often used when talking about diving in Fiji. Originally coined by Jacque Cousteau (his son Jean Michel owns a diving lodge in the northern area of Savusavu), it really applies more to certain locations. There are definitely some areas that have much better soft corals, like Taveuni and the Somosomo straight. Beqa lagoon is also well known for soft corals (Pacific Harbour, along the southern coast of Viti Levu). Conversely, the popular dive sites in the Mamanuca and Yasawa Island groups tend to be more hard corals. 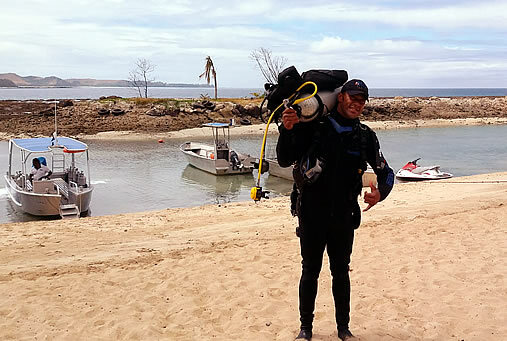 Perhaps the best way to plan a Fiji diving holiday, is to select the type of diving or particular area you want to visit first, and then search for resorts and dive operators that are located in that area. So here is a very basic rundown of your options... for more comprehensive details you will need to visit a dedicated dive website. Almost any resort can cater for divers. Even if they don't run a dive boat themselves, they will almost certainly be in touch with the local operators and can arrange dives for you. However, if diving is more than just a nice activity to do for a day during your vacation, you might want to investigate specialized dive resorts. Locations and dive sites/operators coming very soon.